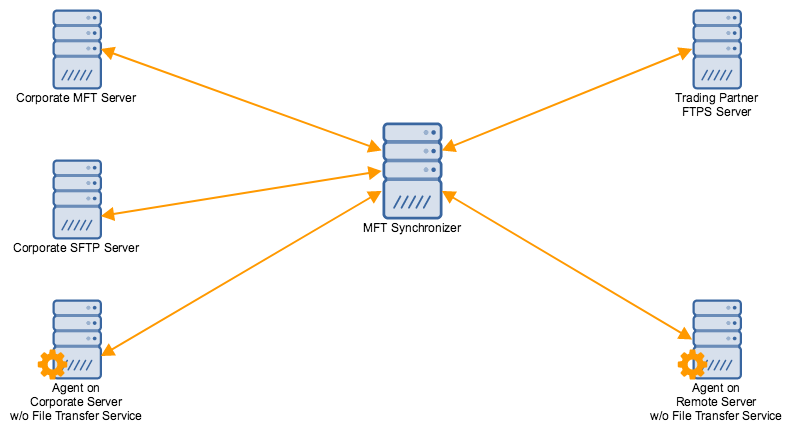 JSCAPE MFT Synchronizer is a platform independent file synchronization server centralizing all of your synchronization processes into a single easy to use web based application. JSCAPE MFT Synchronizer supports all major file transfer protocols including FTP/S, SFTP, AFTP (Accelerated File Transfer Protocol) and HTTP/S as well as an optional platform independent Agent application that may be installed on hosts that do not have a file transfer service and centrally managed from within MFT Synchronizer. Utilizing a hub and spoke network topology JSCAPE MFT Synchronizer is able to synchronize files from spoke to hub, hub to spoke or spoke to spoke all with ease and complete visibility.